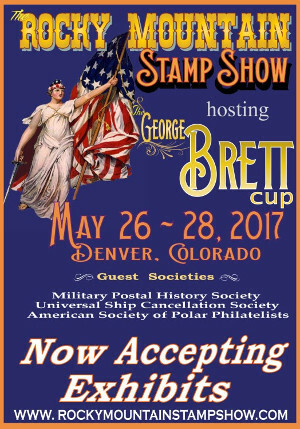 The Society held its annual meeting at the Rocky Mountain Stamp Show, May 26-28. There were a number of interesting exhibits of military postal material. On Thursday, May 25, there was an all-day seminar of military postal history, with the presentations provided by many Society members. The membership rate structure has changed for calendar year 2016. See the Membership Page for the Military Postal History Society for more information. (4/14/2016) The lastest auctions have been posted on the website. There are two this time, one as published in the Spring 2016 Special Edition of the Bulletin (#211), and an additional Online-Only auction (#211 Bis) to handle the overflow from previous auctions. The primary auction is Military Postal History Society, Sale 211, Closing June 11, 2016. The Online-Only auction is available for viewing at Military Postal History Society, Sale 211 Bis (Online Only), Closing June 18, 2016. (2/2/2016) We are updating the website to be compatible with phones, tablets, and of course, computer screens. This will be an ongoing project. The term for allowing this sender is called "whitelisting". If you have questions about setting up this rule in your email program, just use a search engine, or your help menu, to look for articles on whitelists or "allowed senders". Meanwhile, check your "junk" email folder to see if our messages were put there by your email handler. The Society has published a special 2016 edition of the Bulletin for this major event. Check the Bulletin for information about Society on-site activities planned in New York.